I picked this up on my way to Ohio in October from a 1964 issue of Good Housekeeping. The June issue. Here's to many more. Scanned this using my phone, so not tip top! 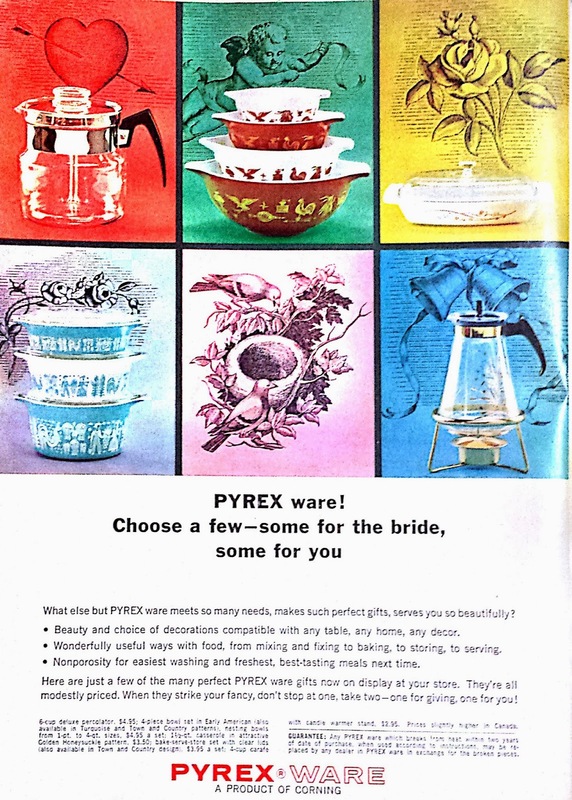 This vintage Pyrex advertisement features one of my favourite patterns - Butterprint, along side some Early American, Golden Honeysuckle, a percolator & a carafe. How great! I love vintage ads and Pyrex ads are especially fun, and help with patterns. That's a nice one! Great find! If you keep reading blogs, I reckon that will kick start that collection. That's how it happened to me (I think!). Oh the early 60's and "Early American" ahhhh how grand! "Choose a few--some for the bride, some for you." Love it!